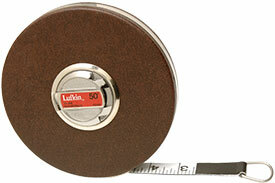 Lufkin Hi Line synthetic tape measures feature a synthetic fiber blade that is non-conductive. Lufkin Hi Line synthetic tape measures have a steel case with vinyl covering and have a ring or hook attached on the end. The HD403N Lufkin Hi Line Synthetic Tape Measure is one of thousands of quality tooling products available from MRO Tools. Please browse Lufkin Hi Line Synthetic Tape Measures for tools similar to the HD403N Lufkin Hi Line Synthetic Tape Measure. HD403N Lufkin Hi Line Synthetic Tape Measure description summary: Lufkin Hi Line synthetic tape measure. Blade Size Width: 5/8'' Blade Size Length: 50' Blade Style: C6 Quantity discounts may be available for the HD403N Lufkin Hi Line Synthetic Tape Measure. Please contact MRO Tools for details.